A study recently released announced that vitamin D may help lower the risk of bone fracture. The study showed participants over 64 who took 800 international units of vitamin daily saw a 30 percent decrease in the risk of hip fracture and a 14 percent decrease in the risk of other fractured bones. So how do you get vitamin D? Besides taking supplements, vitamin D can be found naturally in limited sunlight exposure and in some foods including salmon, mackerel, shiitake mushrooms, sardines and eggs. Taking calcium supplements or eating calcium-rich foods with vitamin D will help to absorb the nutrients. 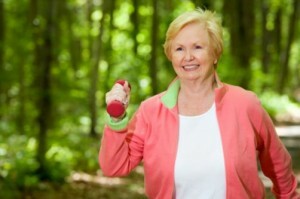 Another way to prevent bone fractures is to strengthen bones through weight training. Weight training at any age has been shown to improve bone density by driving calcium into the bones and it increases overall balance and strength, preventing falls that could lead to injuries. While running or jumping may be too strenuous for some people, weight training with light free weights or weight machines two to three times a week will allow you to select the best weight for you and allow recovery time.